I love supporting our local farms, shopping at farmers’ markets and seeking out locally grown produce in grocery stores. Among the best ways I’ve found to support our farmers is to participate in a CSA (community supported agriculture). 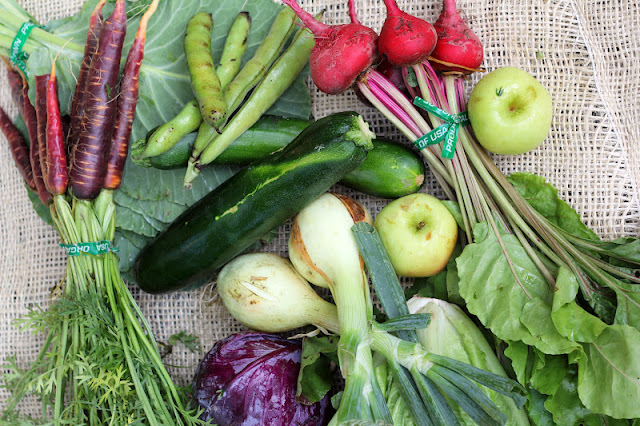 Joining a CSA ensures that you receive the freshest veggies in season each week, and also challenges you to use new produce that you might not normally pick up at the market. Oxbow Farm is a marvelous farm here in Washington that offers tours, education and CSA membership in addition to growing their beautiful fruit and vegetables. This season they created The Oxbow Box Project and have invited local food writers and cooks to share how they are cooking with the farm’s bounty. I am excited to join in the fun! I picked up a complimentary box of produce (thank you, Oxbow!) and in it found carrots, Chioggia beets, fava beans, red cabbage, Jericho romaine lettuce, collard greens, Walla Walla sweet onions, zucchini and Pristine apples. As I unpacked the box, various questions began floating around in my mind. Can I bake something? What to do with favas? How do I incorporate chocolate? CSA boxes have pushed my cooking boundaries in new directions. Last year, when I encountered fava beans, I tediously shelled, boiled, peeled and cooked the beans. A lot of work for a few pounds of beans! This summer, I’ve seen several references to roasting or grilling fava beans whole ... love this idea and that is what we did (think edamame on the barbecue). This makes a wonderful, interactive appetizer in your backyard! As we were also grilling hamburgers, some of the Walla Walla onions made their way to the toppings buffet (these onions are so sweet you could eat them like apples!). Another evening, I shredded the red cabbage and mixed it with sliced onions, honey, red wine vinegar and salt and let it sit to marinate for a few hours. A simple, refreshing slaw! I also baked a chocolate cake. I began by grating the zucchini and apples, then mixed in brown sugar, some whole wheat flour and olive oil. Rather than adding cinnamon or nutmeg for a more traditional spice cake, I stirred in cocoa powder to create a dark, chocolaty batter. I couldn’t decide if I was going for healthy or indulgent, so I decided to shoot for both and topped the cake with pepitas and chocolate chunks. The cake emerged from the oven smelling divine. It has a tender crumb, moist texture from apples and zucchini and light chocolate flavor. Neither heavy nor rich, it was quite welcome on a hot day. Simply put, this is picnic cake, nothing fancy, no plates, forks or adornment needed. Just grab a few napkins and start cutting. Preheat the oven to 350 degrees. Butter an 8x8 inch cake pan and set aside. 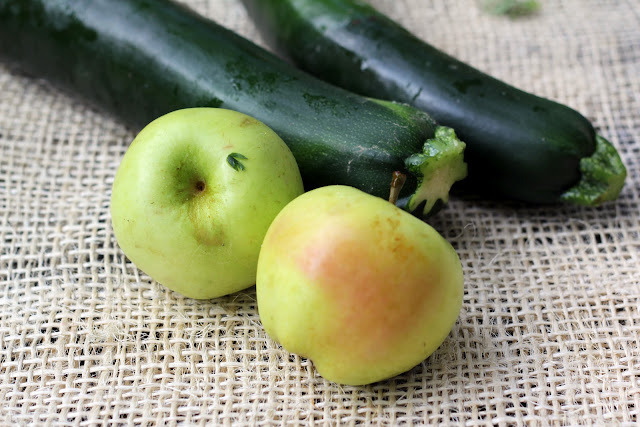 In a large mixing bowl, stir together the zucchini, apples, eggs, brown sugar, olive oil and vanilla. In a smaller bowl, sift together the flours, cocoa powder, salt, baking soda and baking powder. Gently stir this mixture into the zucchini and apple mixture until mixed. Spoon the batter into the prepared cake pan. Sprinkle the chocolate chunks and pepitas over the top. Bake for 25 minutes, until a tester comes out clean. Let cool before slicing. Oxbow Farms provided me with a complimentary box in return for sharing my experiences using their produce. All photographs, recipes and opinions are my own. Stay tuned for Part Two! This is very creative and looks so yummy. Can't wait to see the next post on Oxbow's CSA! I'm happy you can still support Washington farmers where you are, Marina! We tried a CSA program here and it was a total disaster. The people running it really had no idea what they were doing. One time all we got was spinach and it was only enough to feed us for one meal. That was the end of that! I keep hoping another farm will start a really good CSA program. Thanks, Lauren! We are very fortunate to have the farms/produce/CSAs that we do here. I hope a more successful program starts up in your area - I'm sure there would be a lot of people in your community happy to join! That is one beautiful cake! Love the sound of it. 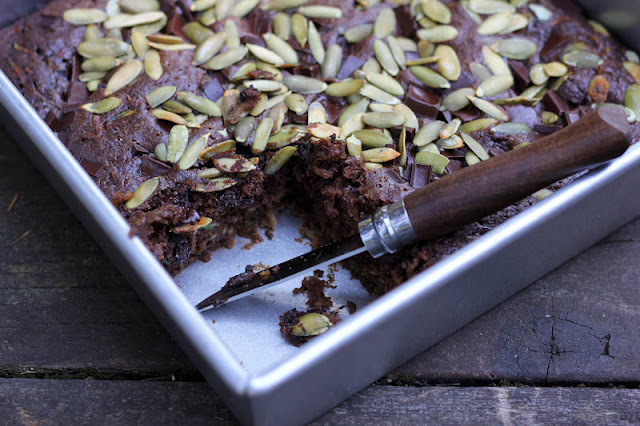 I want to try making it without eggs :) Love the idea of apple + zucchinis + chocolate! Thank you so much, Chinmayie! With the lovely cakes I've seen you create I'm sure you would be able to make this successfully without eggs. Let me know how it turns out! Absolutely agree...CSA's definitely push us to explore. I'd never heard of kohlrabi...now I make it all the time! Yes! Kohlrabi is another happy CSA discovery and I love it, too. I made sunchokes for the first time last year and they are delicious, as well. Hah! You know, I read this post when it went up and got so distracted by Oxbow I just realized I forgot to leave a comment! 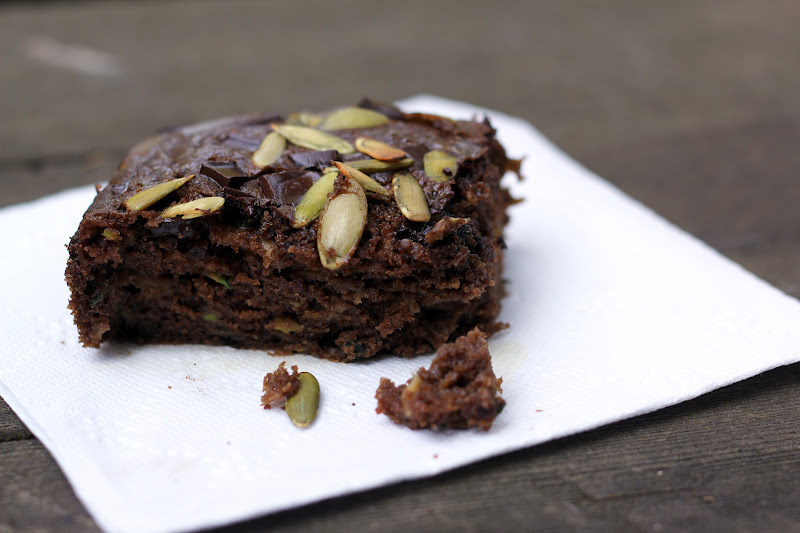 I love the idea of zucchini in a chocolate cake! I usually stick it in banana bread, but chocolate is sooo much yummier! Ohh, I like your suggestion of zucchini in banana bread, Brooke! I'll have to try that ... no shortage of zucchini to enjoy around here. What a great idea to combine apples and zucchini in this cake! Thank you, Laura! I love it when fruit and veggies are part of treats. Hope you're enjoying your weekend!